Often separated from other immigrants because of their language, Italian immigrants to New York City in the 1880s formed communities apart from their new neighbors. They tended to think of themselves collectively as a small Italian colony, La Colonia, that made up part of the demographics of the city. In each of the five boroughs, Italians set up many colonie. Several of them dotted Manhattan in East Harlem, the West Village, what is now SoHo, and the downtown area of the Lower East Side, straddling Canal Street, which still identifies Manhattan's Little Italy, the best-known Italian neighborhood in America. Little Italy is made up of stunning photographs culled from numerous private and public collections. It begins with the first phase of immigrants to Lower Manhattan in the early 1800s, including political and religious refugees such as Lorenzo Da Ponte and Giuseppe Garibaldi. 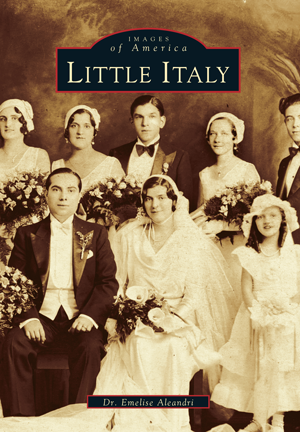 In the 1870s, more and more Italian immigrants settled in Little Italy. As the neighborhood grew up around the former Anthony and Orange Streets, New York's first "Little Italy" emerged. The tumultuous history of the Five Points area, the "Bloody Ole Sixth Ward," and many faces and memories from the Italian newspapers L'Eco d'Italia and Il Progresso Italo-Americano are also included in this long-awaited pictorial history. Dr. Emelise Aleandri is an actress, author, and historian who has known and loved Little Italy since she began her studies about the area as a student. The photographs she has chosen and her research and interviews provide riveting stories of this much loved old neighborhood.